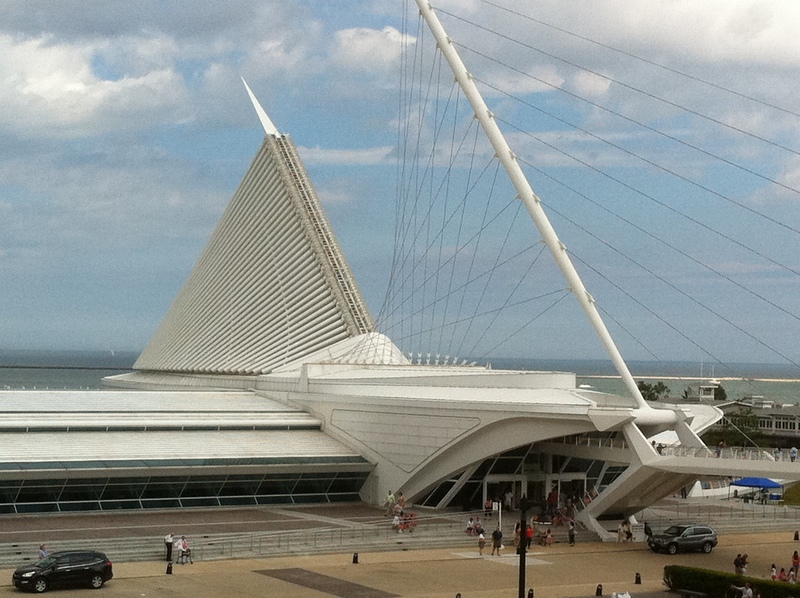 The Milwaukee Art Museum along the shore of Lake Michigan has a nautical feel to many visitors. The unique architecture looks a bit like a ship from various viewpoints. Walking across the bridge feels like a gangplank.
. The wings open up when the museum opens at 10 AM and closes at 5PM most days. At noon the screen is again opened and closed. Schedule changes may occur. 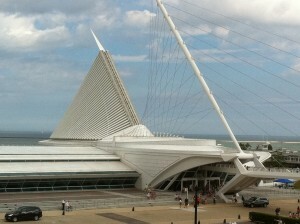 The Milwaukee Art Museum owns an extensive collection of pieces from from Ancient Mediterranean to European to Folk art. Mediums include paintings, sculpture, photographs, video, prints, drawings and decorative art. For lunch, check out Cafe Calatrava in the lower level. The views of Lake Michigan are breathtaking. Eat outside on the patio if the Milwaukee weather is pleasant. When we were there, two teams were playing group table tennis. After hitting the ball the paddle was handed to the next person on the team to hit the return ball. It looked like they were having fun. Wireless internet service is available in the museum.